WASHINGTON Big business and labor have struck a deal on a new low-skilled worker program, removing the biggest hurdle to completion of sweeping immigration legislation allowing 11 million illegal immigrants eventual U.S. citizenship, a person with knowledge of the talks confirmed to CBS News Saturday. The agreement was reached in a phone call late Friday night with AFL-CIO President Richard Trumka, U.S. Chamber of Commerce head Tom Donohue, and Democratic Sen. Chuck Schumer of New York, who's been mediating the dispute. The person familiar with the negotiations told CBS News congressional correspondent Nancy Cordes that Trumka and Donohue "were connected together on a call late last night by Schumer to both say in front of the other they had a deal." Schumer called White House chief of staff Denis McDonough Saturday to inform him of the development. Aides to a bipartisan group of senators working on the immigration plan confirmed to Cordes that there is an "agreement in principle" on the guest worker program. The agreement covers how many workers can be admitted each year, the wages they can be paid, and which professions should be included. A dispute over how to construct this program helped to sink immigration reform in 2007, and the fact that business and labor groups have signed off on this new plan for low-skilled migrant workers should help to win over lawmakers from both sides. The deal must still be signed off on by the other senators working with Schumer, including Republicans John McCain of Arizona and Marco Rubio of Florida, but that's expected to happen, according to a person with knowledge of the talks who spoke on condition of anonymity. With the agreement in place, the senators are expected to unveil their legislation the week of April 8. Their measure would secure the border, crack down on employers, improve legal immigration and create a 13-year pathway to citizenship for the millions of illegal immigrants already here. It's a major second-term priority of President Barack Obama's and would usher in the most dramatic changes to the nation's faltering immigration system in more than two decades. "The strength of the consensus across America for just reform has afforded us the momentum needed to forge an agreement in principle to develop a new type of employer visa system," Trumka said in a statement late Saturday. "We expect that this new program, which benefits not just business, but everyone, will promote long overdue reforms by raising the bar for existing programs." 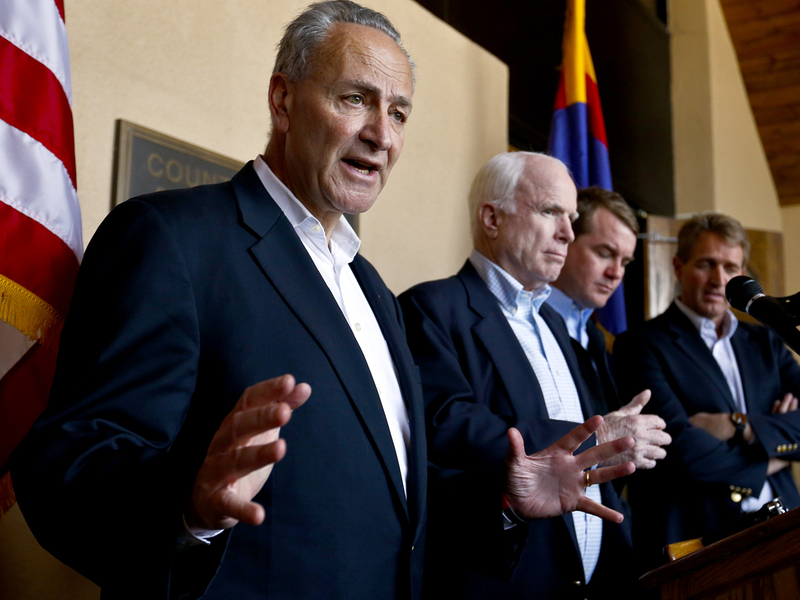 Schumer said: "This issue has always been the dealbreaker on immigration reform, but not this time." The AFL-CIO and the Chamber of Commerce, longtime antagonists over temporary worker programs, had been fighting over wages for tens of thousands of low-skilled workers who would be brought in under the new program to fill jobs in construction, hotels and resorts, nursing homes and restaurants, and other industries. Under the agreement, a new "W" visa program would go into effect beginning April 1, 2015, according to an AFL-CIO fact sheet. In year one of the program, 20,000 workers would be allowed in; in year two, 35,000; in year three, 55,000; and in year four, 75,000. Ultimately the program would be capped at 200,000 workers a year, but the number of visas would fluctuate, depending on unemployment rates, job openings, employer demand and data collected by a new federal bureau pushed by the labor movement as an objective monitor of the market. One-third of all visas in any year would go to businesses with under 25 workers. A "safety valve" would allow employers to exceed the cap if they can show need and pay premium wages, but any additional workers brought in would be subtracted from the following year's cap. The workers could move from employer to employer and would be able to petition for permanent residency after a year, and ultimately seek U.S. citizenship. Neither is possible for temporary workers now. The new program would fill needs employers say they have that are not currently met by U.S. immigration programs. Most industries don't have a good way to hire a steady supply of foreign workers because there's one temporary visa program for low-wage nonagricultural workers but it's capped at 66,000 visas per year and is only supposed to be used for seasonal or temporary jobs. Business has sought temporary worker programs in a quest for a cheaper workforce, but labor has opposed the programs because of concerns over working conditions and the effect on jobs and wages for U.S. workers. The issue helped sink the last major attempt at immigration overhaul in 2007, which the AFL-CIO opposed partly because of temporary worker provisions, and the flare-up earlier this month sparked concerns that the same thing would happen this time around. Agreement between the two traditional foes is one of many indications that immigration reform has its best chance in years in Congress this year. After apparent miscommunications earlier this month between the AFL-CIO and the Chamber of Commerce on the wage issue, the deal resolves it in a way both sides are comfortable with, officials said. Workers would earn actual wages paid to American workers or the prevailing wages for the industry they're working in, whichever is higher. The Labor Department would determine prevailing wage based on customary rates in specific localities, so that it would vary from city to city. There also had been disagreement on how to handle the construction industry, which unions argue is different from other industries in the new program because it can be more seasonal in nature and includes a number of higher-skilled trades. The official said the resolution will cap at 15,000 a year the number of visas that can be sought by the construction industry. Schumer called White House chief of staff Denis McDonough on Saturday to inform him of the deal, the person with knowledge of the talks said. The three principals in the talks  Trumka, Donohue and Schumer  agreed they should meet for dinner soon to celebrate, the person said. However, in a sign of the delicate and uncertain negotiations still ahead, Rubio sent a letter Saturday to Judiciary Committee Chairman Patrick Leahy, D-Vt., calling for a deliberate hearing process on the new legislation and cautioning against a "rush to legislate." Rubio and a number of other Republicans are striking a tricky balance as they simultaneously court conservative and Hispanic voters on the immigration issue. Separately, the new immigration bill also is expected to offer many more visas for high-tech workers, new visas for agriculture workers, and provisions allowing some agriculture workers already in the U.S. a speedier path to citizenship than that provided to other illegal immigrants, in an effort to create a stable agricultural workforce.